We round up the best monitor calibrator tools you can buy – but which is the best for you? There's perhaps nothing more important when working professionally on photographs and digital art than getting the best monitor calibrator that money can buy. The best monitor calibrators on this list have been picked due to their ease of use – and the features they offer. Having the best monitor calibration tool for your needs allows you to configure your monitor so that it displays colours as accurately as possible. While many people are fine calibrating by eye, modern monitor calibrators are just as quick and almost as convenient to use, and are much more accurate. But using one of the tools on this best monitor calibrators list will make the process even more simple, while ensuring the colours are as accurate as possible, ready for you to apply colour theory to your work. The best monitor calibrators for designers won't just look at the colours on your screen, however. Many will also detect ambient light in the room where you work. This has a big impact on how colours will appear on a screen, and can make sure your monitor is displaying accurate colours no matter what your lighting conditions are. Perhaps most importantly, a properly calibrated monitor will ease eye strain when you're working on it for long periods of time, making it safer and more comfortable. So once you've got a brilliant monitor (see our buying guide the best monitors for designers for help choosing one), there are plenty of options for calibration including software downloads, online tools and the built-in calibration tools within Windows and macOS. But nothing offers the accuracy and continuity of a hardware calibrator. A hardware calibration tool need not break the bank, so we've rounded up the six best options for you below. As well as making laptop screens and desktop monitors just right, the Spyder5ELITE provides a lot more in terms of setup, but only takes around five minutes to calibrate (less for subsequent calibrations). There's a simple wizard-based mode but also an expert mode, too. There are 'unlimited' calibration settings plus grey-balancing. You can calibrate all of your displays to a single target, while there's room light monitoring to determine the optimal monitor brightness. You're able to see 'before and after' results using your own images. The incredible X-Rite i1 Display PRO comes with a heap of options, but then you do pay for it. You're able to use your profile across multiple displays (either on the same machine or network) as well as assess the ambient light in your workspace to set your monitor up for best results. A technology called Flare Correct will measure and adjust your display profile for reduced contrast ratios caused by glare on your screen. Video colour standards are also incorporated, so video editors can set up their display for best results, too. The X-Rite i1 Display PRO is a little expensive, but our price comparison tool trawls the web to find you the best price. The Datacolor Spyder5EXPRESS is a really simple route to colour accuracy and is best for hobbyists, students and prosumers rather than pro designers. It's an easy four-step process with just two settings and you can see a 'before and after' view on preset images. The software is available via a download link provided with the box. Professional creatives will probably be looking for more, though. 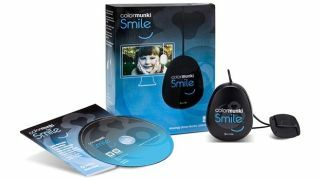 The X-Rite ColorMunki Smile features some of the best monitor calibrator software anywhere. All you need to do is start it up, place the ColorMunki Smile on your monitor and click 'go'. Quick and easy is the name of the game – just plug the device into your computer's USB port. As with the other contenders here, you'll be able to see the before and after results to check out the level of improvement. The X-Rite ColorMunki Design enables professional designers – or indeed anybody who works with colour – to calibrate LCD and laptop displays, RGB and CMYK printers, and digital projectors. You can create and name unlimited custom colour palettes using the included software, while you can automatically synchronise your palettes to Adobe Photoshop CC and InDesign CC in addition to QuarkXpress. You're also able to export them to other photo and design applications. Datacolor has a number of monitor calibrators on this list, and for good reason, as the company is a trusted name when it comes to making sure your monitors are displaying colours as accurately as possible. The Datacolor Spyder5PRO is more feature-rich (and pricier) than the Spyder5EXPRESS, but not quite as fully-featured as the Spyder5ELITE. This makes it a brilliant choice for people who want the best monitor calibrators for designers, but want to find a balance between features and price. It's easy to use and can help you calibrate your monitor in minutes. Despite its simplicity, there's a range of settings and ambient light profiles, with in-depth software for helping you get the most out of your screen.